When Saffron Coulter stumbles through a hole in reality, she finds herself trapped in Kena, a magical realm on the brink of civil war. There, her fate becomes intertwined with that of three very different women: Zech, the fast-thinking acolyte of a cunning, powerful exile; Viya, the spoiled, runaway consort of the empire-building ruler, Vex Leoden; and Gwen, an Earth-born worldwalker whose greatest regret is putting Leoden on the throne. But Leoden has allies, too, chief among them the Vex’Mara Kadeja, a dangerous ex-priestess who shares his dreams of conquest. Pursued by Leoden and aided by the Shavaktiin, a secretive order of storytellers and mystics, the rebels flee to Veksh, a neighboring matriarchy ruled by the fearsome Council of Queens. Saffron is out of her world and out of her depth, but the further she travels, the more she finds herself bound to her friends with ties of blood and magic. Can one girl – an accidental worldwalker – really be the key to saving Kena? Or will she just die trying? An eARC of this book was provided by the publisher in exchange for an honest review. 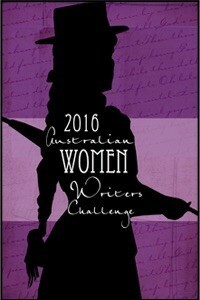 This review is presented as part of my contribution to the Australian Women Writers Challenge 2016. 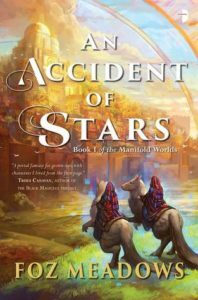 An Accident of Stars is a very solid debut novel from Foz Meadows, it truly brings epic and portal fantasy to life. This book is equal parts the start of an epic story and a coming of age story. This is also a story that disabuses you of the notion that nothing *truly* bad can happen to your heroe(s) in a novel, because there are consequences experienced by protagonist Saffron, and other key characters throughout the novel. There’s a depth and realism to the story because of this commitment in storytelling, and yet it doesn’t ever approach ‘grim dark’ to me, just solid storytelling. One of the things I love most about this book is the sheer diversity of characters in this novel, they come from so many different backgrounds, they have different experiences of gender, sexuality, ethnicity, skin colour, cultural backgrounds. 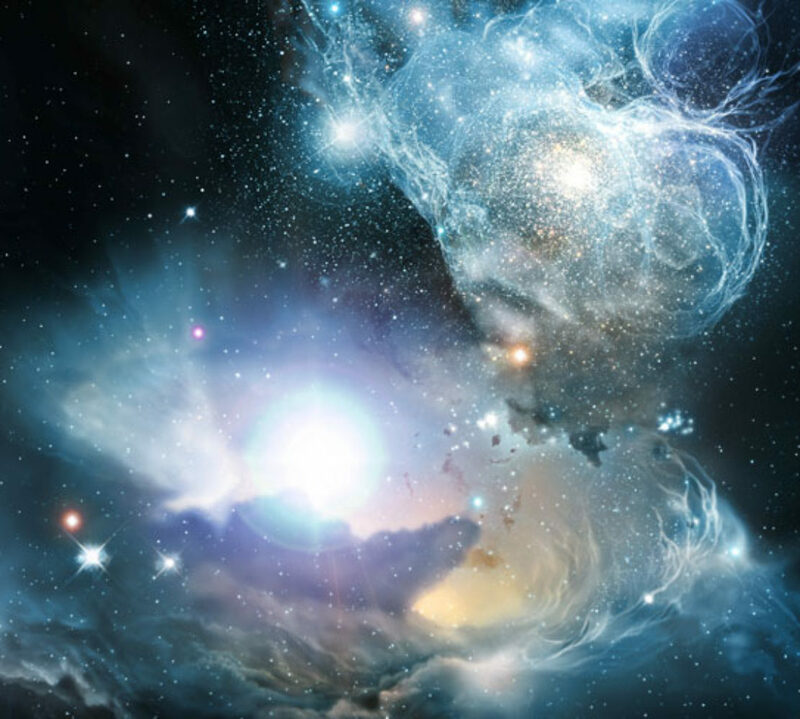 Rather than being mashed together uncomfortably, these elements come together quite seamlessly in the central rebel compound where Saffron finds herself in the beginning of the novel. I loved that an older woman, who was far from perfect was the rebel leader. There are so many women in this book, and the male characters all came with personalities that I am interested in, with stories of theirs I wanted to explore – rarer than you might suppose these days. This novel is a triumph to diversity – I’m sure there are improvements, nothing can be everything to everyone but I think this makes a good effort at doing so. There is a lot going on in the story, as the readers we share in Saffron’s confusion as things unfold – twists and turns in how things affect the rebels, the potential impact on Saffron her self. There’s physical, emotional and political battles involved in this story – it’s multifaceted which gives the story depth, things happen do not happen in a vacuum or in isolation. The storytelling well thought out and executed, making this a satisfying read. If I have one criticism it is that the book is a debut novel and the writing does reflect this, I found it clunky in places, and in others it threw me out of the reading experience. This is a minor criticism though as overall it is a well polished first novel, and everyone is allowed to grow over time. There is always a starting point – this is an excellent one. I also thought this book was nicely self-contained, you don’t *have* to read the next book if you don’t want to or don’t like series. There’s the opening and minor-cliffhanger for more story but you could absolutely ignore that without any issue. I am looking forward to the next book though because I’m interested to see where the characters go from here and how the broader story unfolds.